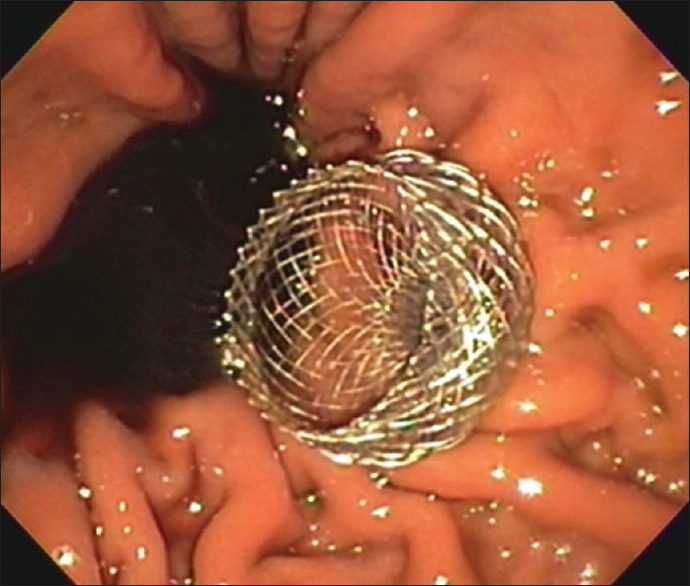 In the United States, lumen-apposing metal stents (LAMSs) were made available for use to drain pancreatic fluid collections (PFCs) including pseudocysts and walled-off pancreatic necrosis (WOPN) in 2014. The use of these devices has been highly successful.,, Until recently, only 10- and 15-mm diameter LAMSs were available. Recently, a 20-mm diameter LAMS has been introduced. This may allow faster drainage and facilitate debridement of WOPN. This letter describes a single-author experience with a 20-mm LAMS (Axios, Boston Scientific, Natick, MA, USA). Fourteen patients underwent placement of a 20-mm LAMS. Nine were male and five were female. The mean age was 46 years old (range: 31–63 years). All patients were Caucasian. The etiology of the pancreatitis in the patients was as follows: alcohol n = 5, gallstones n = 4, idiopathic n = 2, postsurgical n = 2, and post-ERCP pancreatitis n = 1. All patients were >4 weeks removed from the initial appearance of their PFC as seen on cross-sectional imaging at the time of their LAMS placement. Four patients were referred for rescue therapy after failure of previously placed percutaneous drains to resolve the fluid collection, infection, or both. All patients had the 20-mm LAMS placed in the setting of large PFCs, all of which were felt to represent pancreatic necrosis [Figure 1]. The mean PFC size was 142 mm (range: 80–240 mm). In 8 patients, the PFC was in the head, body, and tail of the pancreas. In 6 patients, the PFC was in the body and tail of the pancreas. Based on cross-sectional imaging and EUS measurements, the average PFC contained 45.7% internal solid debris (range: 20%–90% internal solid debris). All LAMS placements were technically successful and all used an electrocautery-enhanced delivery catheter. In 4/14 patients, the LAMS was balloon dilated after deployment to facilitate drainage of the PFC contents (mean balloon diameter was 12 mm). Eight out of 14 patients underwent placement of 1–2 double-pigtail plastic stents through the LAMS. There were no adverse events related to LAMS placement in any patient. All patients received intra-procedural antibiotics (levofloxacin 500 mg IV) at the time of LAMS placement and a brief course of postprocedure antibiotics. No patient received a nasocystic tube and no patient underwent direct endoscopic necrosectomy (DEN) at the time of initial LAMS placement. Subsequent necrosectomy sessions were performed approximately every 2 weeks based on individualized treatment plans. DEN was performed with mechanical debridement using baskets, snares, nets, and rat tooth forceps as needed in the standard manner. In addition, at the time of necrosectomy, all patients underwent lavage of the cyst cavity with hydrogen peroxide solution diluted 3:1 with isotonic saline. The mean number of DEN sessions to achieve resolution of the PFC was 2.5 (range: 1–4). The mean LAMS indwell time was 61 days (range: 30–120 days). No patients experienced bleeding or migration of the LAMS. One patient developed LAMS occlusion that was noted on a scheduled DEN procedure and manually debrided. No patient experienced recurrence of their PFC. Two patients died with the LAMS in place. One patient developed a distal small bowel perforation unrelated to her pancreatitis 17 days after LAMS placement and was not felt to be a surgical candidate. On this patient's final computed tomography (CT) scan, the PFC was almost entirely resolved and the LAMS was in good position. The second patient developed sepsis and bowel ischemia of unclear cause 20 days after LAMS placement. This patient's final CT also showed that the PFC was decompressed and the LAMS was in good position. Neither death was attributed to the LAMS. Overall, the 20-mm LAMS was felt to be safe and effective for use in patients with large PFC/WOPN in this single-operator experience. This device facilitated endoscopic treatment of very large PFC/WOPN. It is unclear if the 20-mm LAMS should be reserved for patients with large PFCs or should be used in any patient with a large enough PFC felt to warrant endoscopic drainage. Further studies will be needed to compare this device to existing sizes in terms of safety and efficacy. Adler DG, Taylor LJ, Hasan R, et al. A retrospective study evaluating endoscopic ultrasound-guided drainage of pancreatic fluid collections using a novel lumen-apposing metal stent on an electrocautery enhanced delivery system. Endosc Ultrasound 2017;6:389-93. Yoo J, Yan L, Hasan R, et al. Feasibility, safety, and outcomes of a single-step endoscopic ultrasonography-guided drainage of pancreatic fluid collections without fluoroscopy using a novel electrocautery-enhanced lumen-apposing, self-expanding metal stent. Endosc Ultrasound 2017;6:131-5. Guo J, Saftoiu A, Vilmann P, et al. Amulti-institutional consensus on how to perform endoscopic ultrasound-guided peri-pancreatic fluid collection drainage and endoscopic necrosectomy. Endosc Ultrasound 2017;6:285-91.